Good evening, dear ones! Tonight, I have two fun things to share: a new shirtdress and a long promised announcement. I know, you can hardly contain your excitement, right? My announcement is just so mysterious. Yeah, I'm rolling my eyes, too. 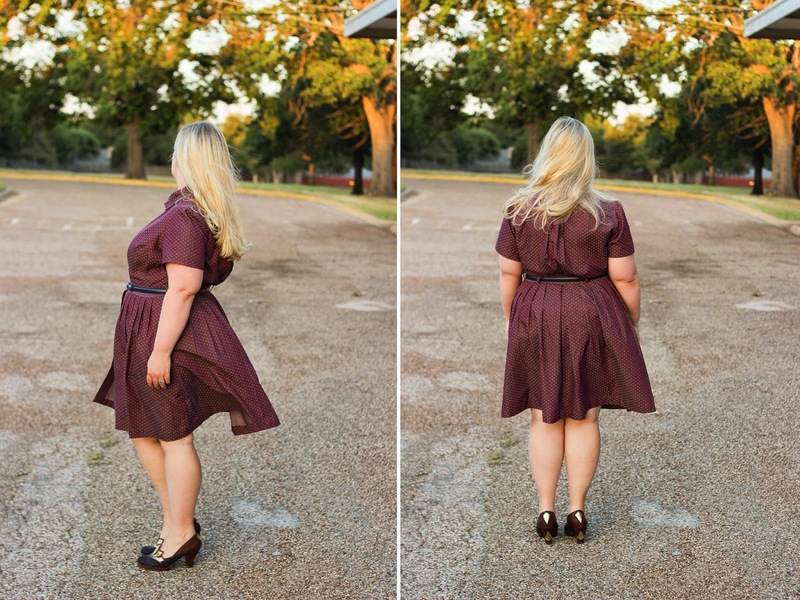 Let's start with the shirtdress, then move on to the (still very fun!) non-surprise, shall we? This dress is yet another version of McCall's 6696, The Shirtdress Pattern of Wonder and Bliss. Last month, I bought a length of Robert Kaufman's Dotted Chambray in a lovely dusty green, meant to become a button down for Sam. My intentions were so pure and loving! Then, the fabric arrived. Y'all, this stuff is gorgeous. It's a perfect medium-to-light weight, drapes really well, and presses beautifully. It even has "pin dots," which we all know are just grown up, man-friendly polka dots. My baser instincts demanded that I steal it, claim total ignorance about its intended use, and turn it into a shirtdress. Ahem. My conscience quickly recovered, of course. 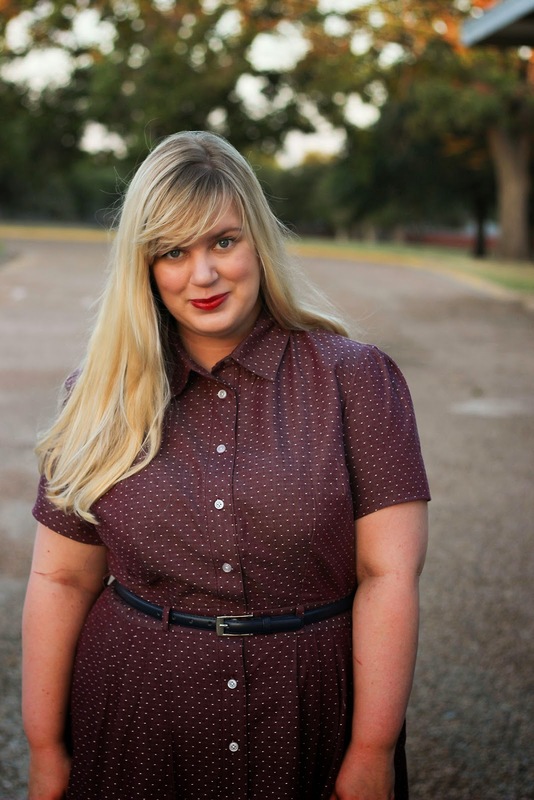 Instead of stealing his Baylor green chambray, I ordered some in my own dear Texas A&M maroon. That's not what Robert Kaufman & co. have named these colors, of course. They are calling them "olive" and "burgundy," but I know school spirit when I see it. 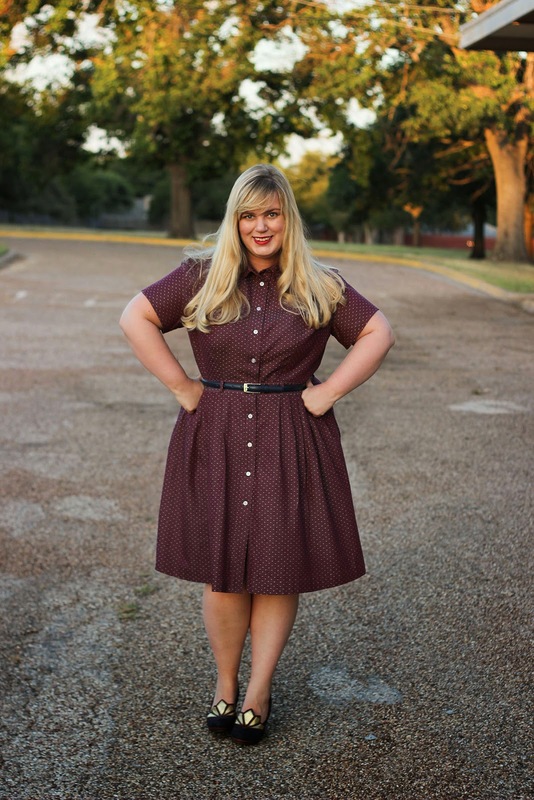 This is Aggie Maroon and my favorite shirtdress yet! You have heard about this pattern ad nauseam from me, but let's quickly go over the details anyhow. This dress is made up with three yards of the aforementioned chambray, ten white classic shirt buttons, and top-stitching everywhere I could get away with it. The insides are finished with my new favorite technique ever, serging with gray thread. It's shockingly unobtrusive on colored fabrics! Why don't people shout this technique from the rooftops? As someone who's extra lazy about changing out serger thread, it's a godsend. As for alterations, I used my pattern pieces from the last few 6696s. This means the whole dress is a Size 20, with a one-inch full bust adjustment, narrow shoulder adjustment, and wide bicep adjustment. I do need to go back and resteam the collar, since one side is bunching a bit, but otherwise it fits like a dream. Perfected patterns are so lovely. So, another 6696. Are you tired of them yet? I'm certainly hope not. This version may be more subdued than the others, but I absolutely adore it. Believe all the good things you've heard about Robert Kaufman's chambrays, kittens. 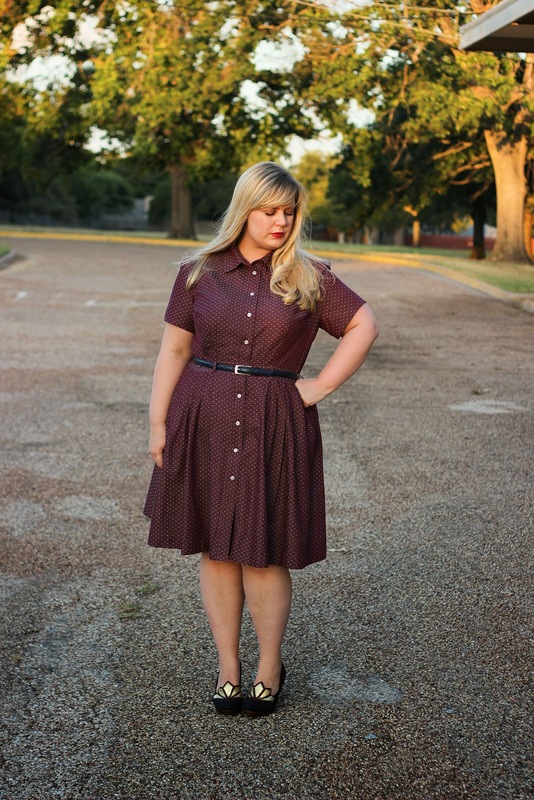 I'm far too tempted to order this in a few more colorways, for a parade of dotted shirtdresses! 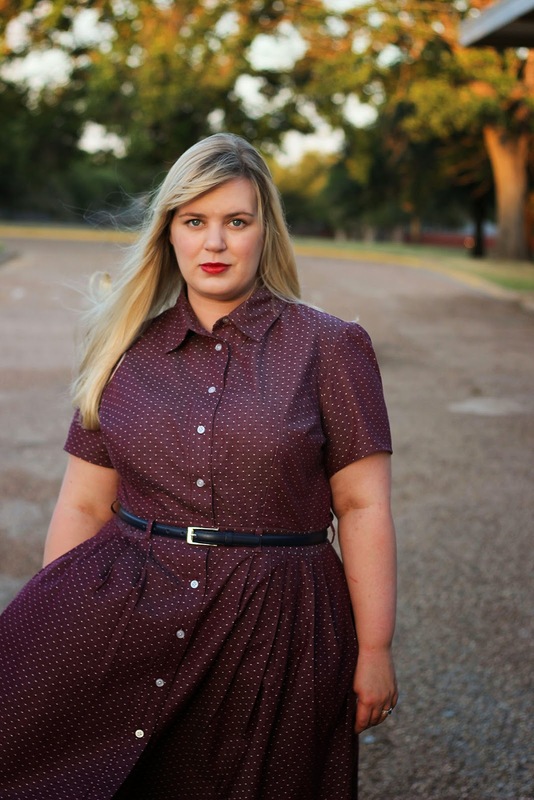 If you're hankering for a shirtdress of your own, I have very good news. That announcement I've been teasing for a week or two is finally ready to be shared. 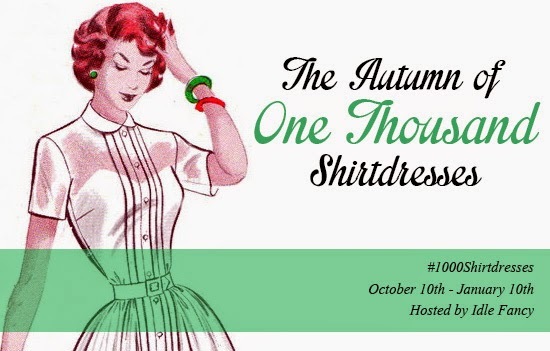 The Autumn of One Thousand Shirtdresses is now an official sewing challenge! Multiple people asked if I would host a sew-along for McCall's 6696, as part of my own quest to make all the shirtdresses. Honestly, an official sew-along is something I've never wanted to host for a couple of reasons. 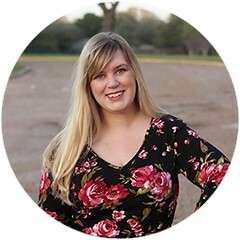 Not only is it a ton of work, as the lovely Jenny can attest, but most of the information necessary is already out there. People far wiser than I have already done tutorial after tutorial, on everything from collar stands to sleeve plackets. What exactly would my own be adding? Instead, The Autumn of 1000 Shirtdresses will be a sewing challenge. Over the next two months, I'll work through McCall's 6696 in a logical way, though it won't be a classic step-by-step guide. Instead, I'll post a ton of shirtdress specific information, including helpful tutorial round-ups, thoughts on fabric choices, guides to various patterns, and some of my own adjustments, hacks, and tricks. As we go along, I'll keep sharing my own shirtdresses and all the ones that you make, as well! Even better, there are prizes. Of course. Once the challenge wraps up on January 10th, I'll draw a name out of the Flickr pool and give away a bundle of lovely fabrics for future shirtdresses, as well as a vintage shirtdress pattern in the winner's size. Woohoo! So, what are you waiting for? 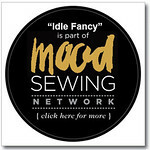 Grab a badge below, pick out some lovely buttons, and get sewing! 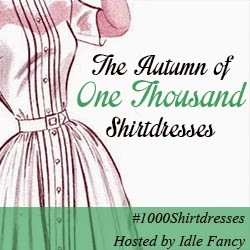 You can use the #1000Shirtdresses hashtag throughout the challenge, on both Instagram and Twitter, and share all of your makes in our Flickr Group. You're also not limited to using 6696--feel free to pick any shirtdress pattern you own, whether it buttons all the way or even just half way. The more shirtdresses, the merrier! A Note for those Down Under: Southern Hemisphere folks, don't fret. 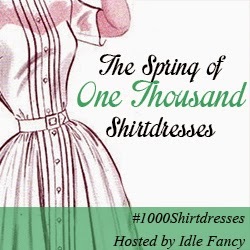 You'll notice there's a special The Spring of 1000 Shirtdresses button for you, as well. Bring on the pretty eyelets! Note: You're not going mad. The dates of this challenge have, in fact, been changed. I wanted as many people who wanted to join to have the chance, so bumping the end date past the holidays seemed the bet plan!